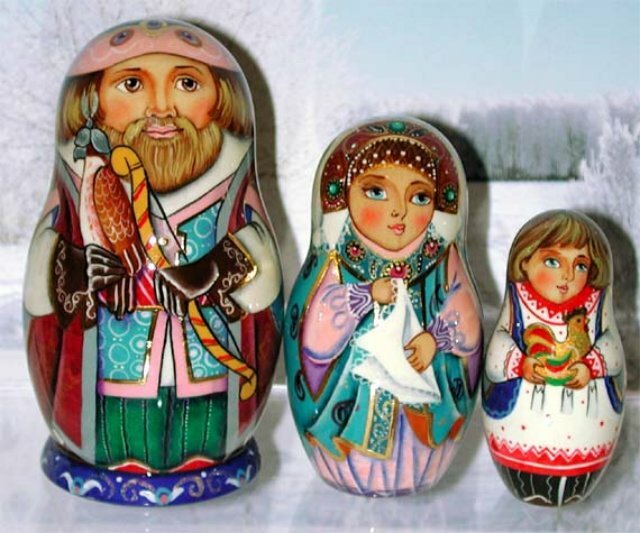 This small, art quality Matryoshka features very detailed, professional artwork -- collectible quality. The dolls are made from linden wood and hand painted by acrylic. The first doll is 4" tall. The doll is signed by the talented Russian artist. The quality of the shiny lacquer is excellent. Small details of head decorations, trim of the vest and gloves on first doll, folds and sleeves on the second doll are decorated with delicate lines of golden foil - looks magnificent!!! Smaller details cannot be seen in the picture - must see the original artwork.